At least 600 weapons stolen from a former United Arab Emirates-run training centre in Mogadishu are for sale in the city, weapons dealers said. 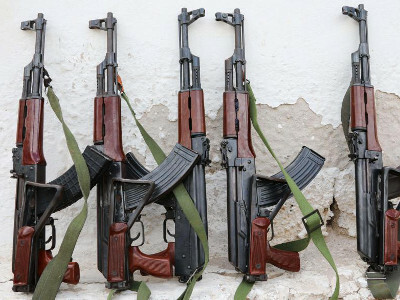 The weapons, including new Kalashnikov assault rifles and Chinese versions of them, were stolen by Somali National Army soldiers trained by the UAE at its facility, three Somalis who purchased weapons from the soldiers told Reuters. The UAE ended the programme on April 15, shortly after security forces at Mogadishu airport seized millions of dollars and temporarily held a UAE plane. Somalia’s relations with the UAE are strained by a dispute between Qatar and Saudi Arabia because Mogadishu refuses to take sides. The UAE and Saudi Arabia have strong trading links with and influence in Somalia, offset by the sway of Qatar and its ally Turkey, one of Somalia’s biggest foreign investors. Neither Somalia nor the UAE is showing urgent interest in resolving the dispute, said Rob Malley, president of the International Crisis Group, a think-tank. Somali officials want to be seen “standing up” to the UAE, “and the Emirati officials’ position is ‘If Somalia doesn’t want our money, fine, we’ll take it elsewhere,'” Malley told Reuters in Nairobi after returning from Mogadishu. The UAE-trained troops began stealing weapons from the facility shortly after the programme was disbanded, dealers said. Soldiers sold guns directly to the dealers and indirectly via their brokers. The looting apparently occurred while the UAE was in the process of emptying its training centre. On Sunday night a ship docked at Mogadishu port was loaded with equipment from the UAE training centre, including several dozen shipping containers of weapons, dozens of armoured vehicles fitted with anti-aircraft guns and hundreds of cars, a port staff member told Reuters. On Monday, gunfire broke out at the former training centre where some troops still were and UAE-trained troops also still there fled with as many weapons as they could, before a rival group took over the facility. Residents told Reuters they saw UAE-trained forces discarding military uniforms and fleeing the facility in three-wheeled rickshaws with guns. After 90 minutes of sporadic gunfire, the facility was secured by presidential palace guards, a Reuters journalist said. Officials from Somalia’s defence ministry did not immediately answer phone calls requesting comment on the weapons theft. Defence Minister Mohamed Mursal resigned this week to contest the vacant position of parliament speaker. Army commander General Abdiweli Jama Gorod said some soldiers behind the attempted theft of equipment from the facility were arrested. “Somali national forces now have in hand the few soldiers and officers who were behind today’s incident and we assure we will bring them before justice,” he said in comments reported by the state-run Somalia News Agency. Gorod did not answer phone calls seeking comment. Due to the diplomatic dispute, the UAE-trained troops are being called “rebels” by some army elements, a security analyst speaking on condition of anonymity said. Dealers showed Reuters five weapons they bought from the soldiers. They all bore the marking “SO XDS”, indicating Somali army ownership. “About 600 to 700 AK-47 and other guns were looted from former UAE training camps,” weapons dealer Jama Ali told Reuters, speaking from Mogadishu where he and two other men presented the weapons. Ali said they purchased the weapons for $700, a significant discount on the current price of $1,350 in Mogadishu for a new Kalashnikov. The dealers began reselling the weapons at $1,000 each, he said.